Our curated collection of year three grammar worksheets has everything your child needs to build a strong foundation in reading, writing, and speaking skills. 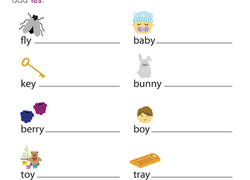 Kids will learn about regular and irregular plural nouns, spice up their writing and vocabulary with adjectives, unscramble sentences so they read correctly, and more in these worksheets that are as helpful as they are entertaining. Train your second grader's grammar eye by helping him practise identifying adverbs in context. Get a head start on grammar with this sentence building worksheet. 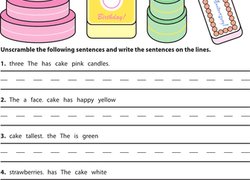 Kids unscramble crazy cake sentences and put the words in an order that makes sense. Kids practise identifying the verb in each sentence, then finding the adverb that describes it to help them see how each part of speech works.